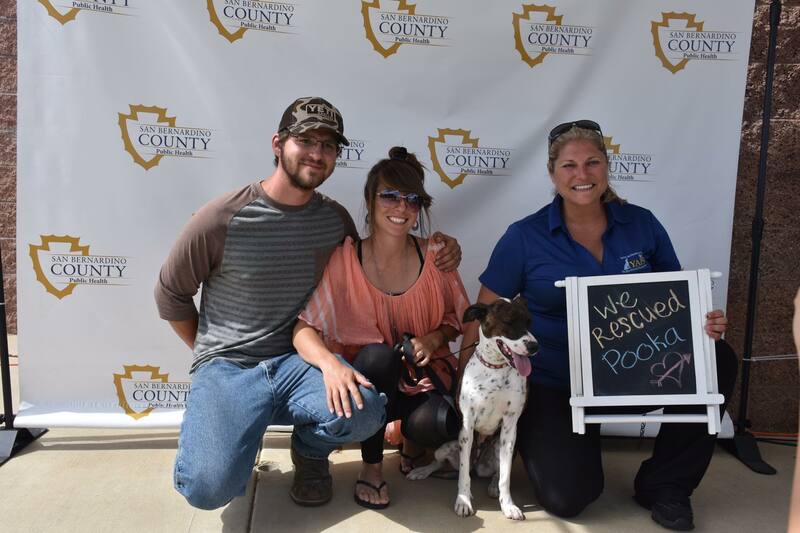 Homeless pets in need of loving homes return to the 7th Annual Mega Pet Adoption Event at Yucaipa Community Park on Saturday April 28 and Sunday April 29, from 10 a.m. to 4 p.m. Animal shelters and rescue groups from throughout the county will have cats and dogs of all sizes, ages, and breeds available for adoption at the two day event. In addition to pet adoptions, there will also be a low cost vaccination clinic offered both days. On-site licensing will be available for residents of Yucaipa and the unincorporated areas of San Bernardino County. Merchandise and food vendors will also be participating. 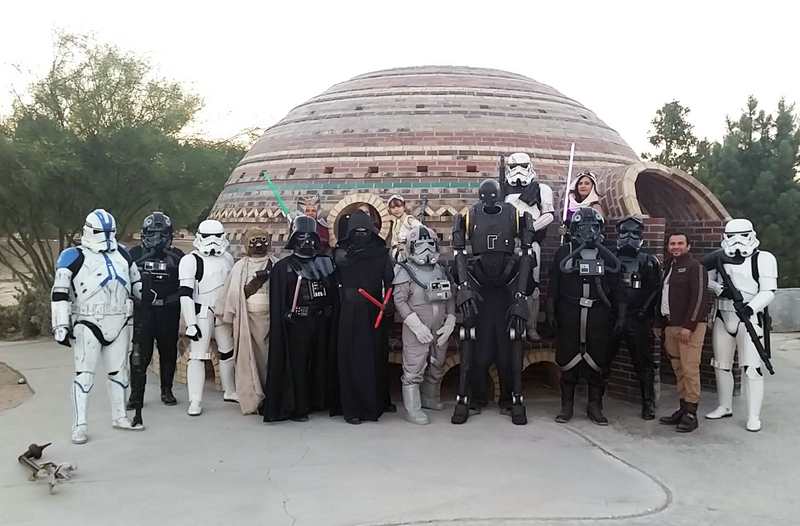 Members of the Inland Empire Squad of the Southern California Garrison, 501st Legion will be in full trooper regalia on Sunday during the event on Sunday. Yucaipa Community Park is located at 34900 Oak Glen Road in the city of Yucaipa. For information about the event please call the San Bernardino County Animal Care and Control Program at 1-800-472-5609 or visit www.sbcounty.gov/acc. 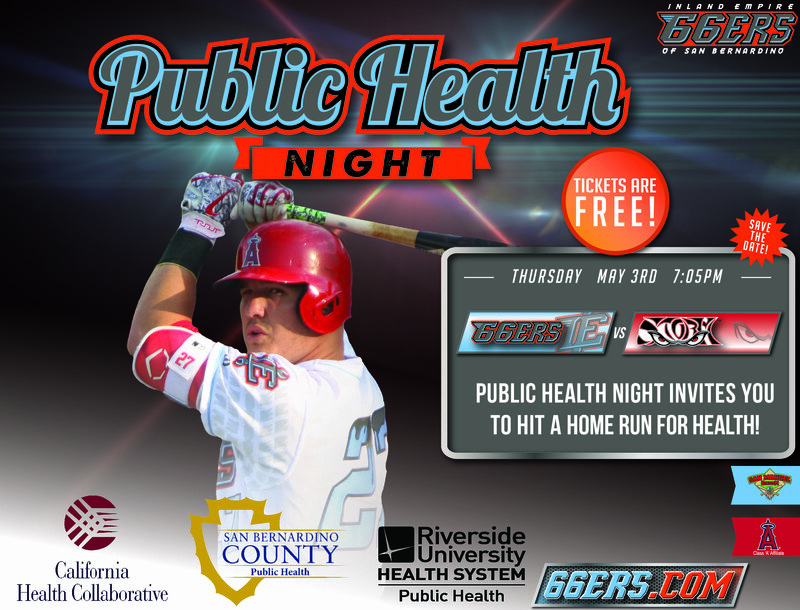 Residents and baseball fans throughout the Inland Empire are invited to hit a “Home Run for Health” May 3 when the Inland Empire 66ers face-off against the Lake Elsinore Storm. Riverside University Health System – Public Health, the San Bernardino County Department of Public Health and the California Health Collaborative – Tobacco Control Program are teaming up again to share positive health messages while enjoying America’s favorite pastime. Admission to the public will be free when the 66ers host the Storm at San Manuel Stadium, 280 South E Street in San Bernardino. Fans are invited to pick free vouchers while supplies last. One voucher can be redeemed for four tickets and families are limited to two vouchers, for eight tickets total. Parking is $7 per vehicle and can be paid in credit or cash. Last year’s inaugural event enjoyed a near-sellout crowd at San Manuel Stadium with thousands of fans stopping by the concourse to learn more about available public health programs, resources and services. This year will feature a pre-game parade and a free Fun Zone for the kids. 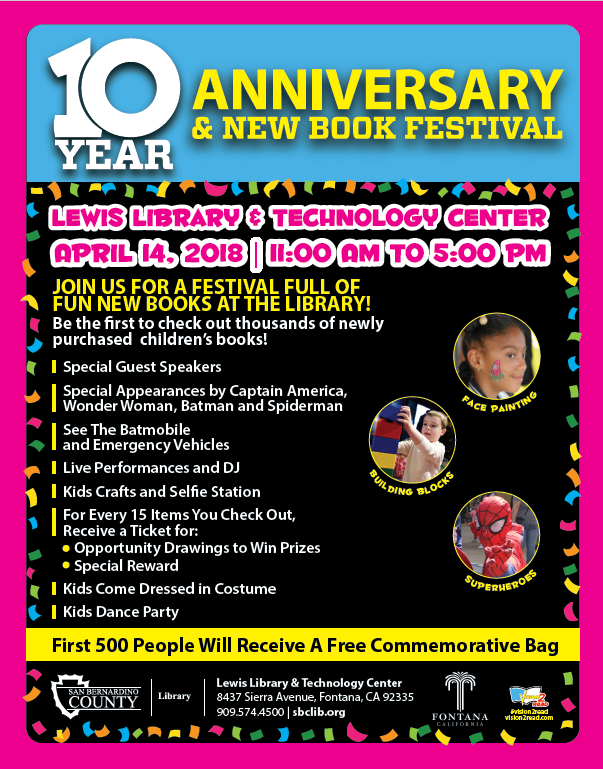 The San Bernardino County Library invites residents to the Fontana Lewis Library & Technology Center for the 3rd Annual New Book Festival and 10th Anniversary. Once again, thousands of new books will be available for patrons for the very first time. Be among the first to crack open one of these wonderful new titles. Come and celebrate literacy and meet Wonder Woman, Batman, Captain America, and Spider Man. Don’t forget to take pictures. Come see the Batmobile, a fire engine, or a police car up close. Build memories in the Jumbo Block play area, make fun crafts, enjoy face painting and balloon artists, dance to a live DJ, and much more. This event is another opportunity to celebrate and support the Countywide Vision’s literacy campaign, Vision2Read. The 3rd Annual Fontana New Book Festival will take place on Saturday, April 14, from 11 a.m. to 4 p.m. Visitors should bring their library card, as every 15 items checked out during the event earns visitors an opportunity drawing ticket for a chance to win awesome prizes. All activities are free and open to all ages. The Fontana Lewis Library & Technology Center is at 8437 Sierra Avenue in Fontana. The San Bernardino County Library invites residents to the Highland Sam J. Racadio Library & Environmental Learning Center for a Library Luau. Don’t forget to take pictures with Moana. Enjoy a variety of fun-filled crafts, a balloon artist, face painter, and more. This event is another opportunity to celebrate and support the Countywide Vision’s literacy campaign, Vision2Read. 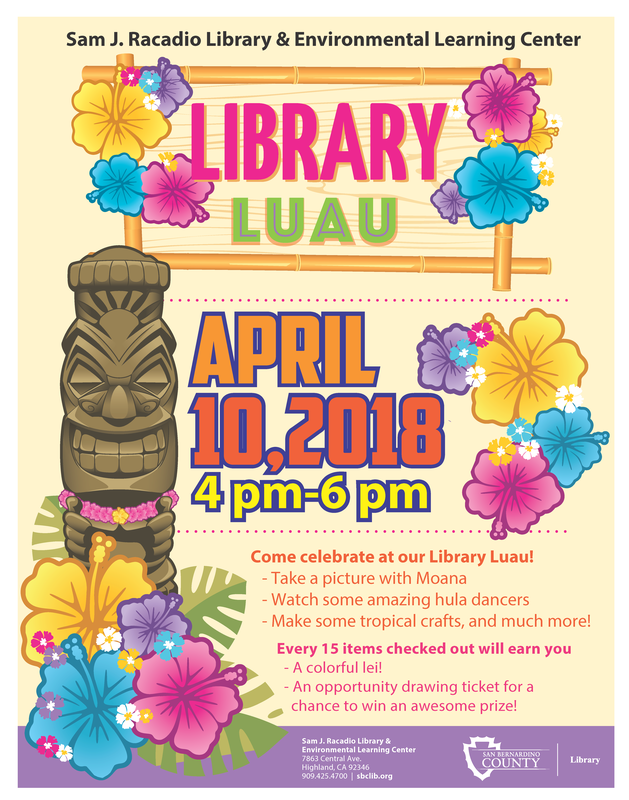 The Library Luau will take place on Tuesday, April 10 from 4 to 7 p.m. Visitors should bring their library cards, as every 15 items checked out during the event earns visitors an opportunity drawing ticket for a chance to win awesome prizes All activities are free and open to all ages. The Sam J. Racadio Library & Environmental Learning Center is at 7863 Central Avenue in Highland.